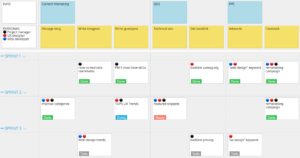 In the previous part, I wrote about how to label user stories with emoji icons to identify different tasks and priority levels. It’s just the top of the iceberg. The next awesome opportunity to use labels is visualizing buyer personas and journeys. In a user-centered world, you can’t miss the buyer persona out of the backlog. StoriesOnBoard offers a smart feature to create personas, add details and assign them to activities. We got user reviews about the feature and some of them say, it’s cool. BUT, we would assign personas directly to steps. Someone would differentiate sub-personas on the story map. Let’s get back to our example story map. If you found an effective structure for activities and user steps, the persona feature is enough to describe persona’s activities. That’s why I put the three main personas above the blue cards. On the other hand, there are user types who won’t finish the whole journey or even an activity. I used the “👓” icon to visualize a blog reader who won’t book a room. Win: 1. Add Touch Keyboard to the toolbar by clicking on it with the right mouse button and select “Show Touch Keyboard”. 2.Open Touch Keyboard with by clicking on the keyboard icon. Although persona feature works well in every PM-tool, most of them offer only one level or one dimension. But it’s scarcely enough for more sophisticated persona mapping. Do you need a second or maybe also a third dimension to personas? I got something for you! 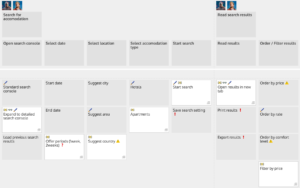 Tag story cards and filter out user-related tasks using the search&filter panel. What can be the second dimension? For example, a habit that is characteristic of more personas and can result in different steps. I made up the “cheap buyer” attribute. Two of my personas can behave as cheap buyers. I used the “💵” for cheap buyers. Sometimes, you don’t need to use sub-persona tags all over the story map. If the second dimension differentiates personas only in one (or a few) activities, then use these tags only on the selected part of the story map. The next hint is similar to a previously described one. Imagine the following case: Your personas do exactly the same steps on the product but the tasks under a step belong to only one persona. 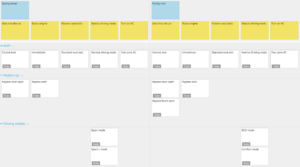 Your team works in sprints (or releases), and you need to visualize the persona related cards. If the journey contains a few steps you can solve the problem by duplicating the steps. If I used only one narrative flow the features would have would be mixed. If I put both personas above the blue card, that would be pointless. No chance to visualize persona related cards in the same narrative flow? But, there is! Just tag user stories, and you’ll see how effective is it. 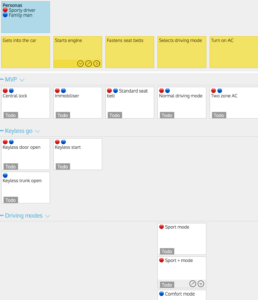 Now you can use the same narrative flow and everything keep organized. “One more thing…” can be visualized with emoji icons, the user journeys. It’s another awesome opportunity, so don’t miss! Easy to understand why is a great opportunity visualizing user journeys on a story map. UX designers struggle to get more priority on user experience. User experience mapping is often just an afterthought but it user journeys help a lot to design better products. Let’s get back to our example story map. We got the personas, sub-personas, the types, and the priorities. 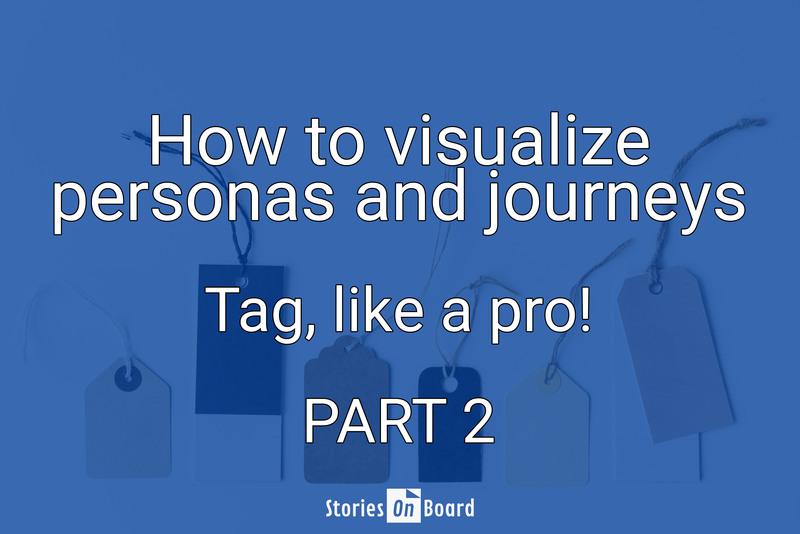 Why don’t we use tags to link user stories into a journey? I created two different journeys for “impulse buyer” and also for “regular buyer” personas. Open the map and follow the journey among the tags. Use the search and filter panel for a better view. I would say you discover easily the holes in the journey, but to be honest you discover it by labeling user stories. Further ideas? Don’t keep it! Leave us a comment below! Good topic, but it would really help if somebody with a better command of English did some editing work before publishing this. There are parts that are very confusing. Thanks for the feedback. We’ll take care of it. If something is still confusing or need further explanation just let me know.